Janet Tlapek of Facility Kitchens successfully met the requirements for HACCP Manager Training. 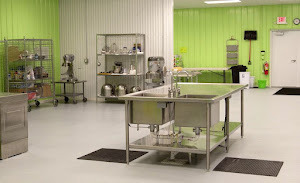 This class is presented by The Right Place, INC. and NSF International. The class was hosted by Steve Kluting of Varnum Law Practice on the top floor of the Varnum Building. The instructor, Harry Grenawitzke RS, MPH, DAAS, of Grenawitzke Consulting, gave an excellent starting class on improving prevention of food borne illnesses throughout the production process.